Home > Blog > Articles > Jazz Spivs On The Road To… Northamptonshire! We love these events, because they’re a throwback to classic British socialising, when roses and violets stood in place of a disco ball. Added to that, we get to feel the breeze on our waistcoats; no small pleasure when you’re huffing into a sax for hours! In fact, we had such a great time, that we’d like to pick apart the details of why it was so special. Although jazz (and our timeless attire) can be mixed into all sorts of moods, it was nice to see, from the off, that the party organisers had gone all-out with their theme: retro garden mania! As we rolled up to the address we were given, it was like falling into an Enid Blyton novel, or a sepia photograph fished from the archive of a country fair. Before us were a regiment of picnic tables dressed in emblems of British teatime. China saucers and pots held our gaze, whilst below them sat huddles of white, cast-iron furniture, glinting in the morning sun. Our client, Dorothy Holdsworth, is a huge fan of 20s-era fashion. 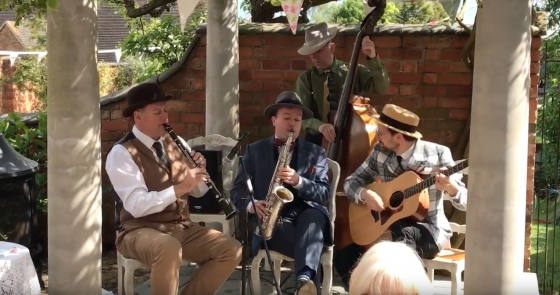 She’d draped a line of bunting above the lawn: the pink, yellow and cream streamers fluttered gently as we were setting up… Then, under the cover of a stone-pillared bandstand, The Jazz Spivs got in-tune and on-track for a day like few others. What’s so awesome about this event – and other vintage get-togethers – is that the 1920s are the unifying aspect of everything swirling around us. From the British teas to the cake and cream, guests were totally on-board with the theme, embracing the pleasures we seem to have shelved on another age. As such, requests came thick and fast, from the farthest reaches of the crowd to those dancing right in the centre. A local restaurant supplied the grub; eventually, champagne corks were popping on the grass (the kind of applause we like to hear!) and bare feet were flying heartily around them. Now that’s the kind of feedback we play for – a happy customer, and a whole new set of jazz hands flying along to our music. Book us for your own soiree today, soaking up the summer glory while it lasts.